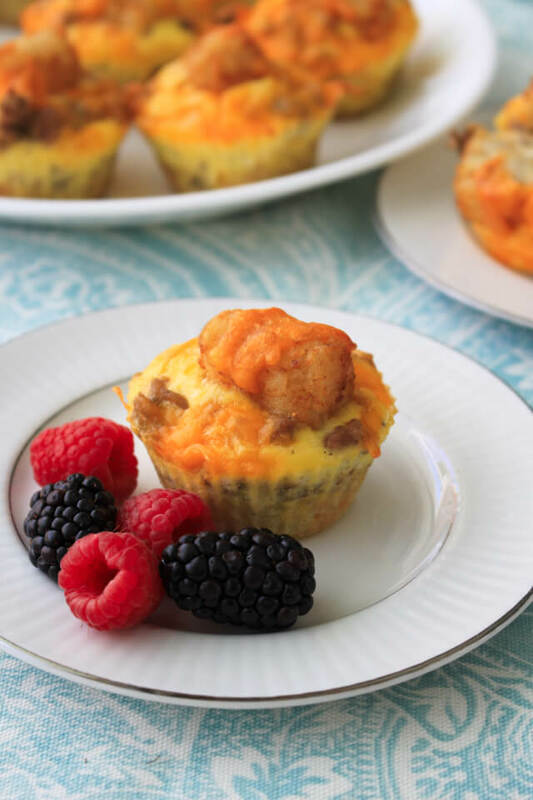 Cheesy Sausage and Tater Tot Breakfast Muffins combine maple turkey sausage, tater tots, eggs, and cheddar cheese in an easy to make muffin cup that can be made ahead and reheated on busy mornings! In my neck of the woods, school days are finally upon us after a summer filled with lazy days soaking up the sun by the pool. I am shifting gears from laid-back mom to on-my-game mom, complete with meal planning, pep talks, and household organization to start the school year off on the right foot. Making sure my kiddos head to school with a great breakfast in their tummies and a well-rounded meal before bed is high on my list of important tasks as a mom. I like my kids to fuel their day with balanced meals full of better for you ingredients. One of my go-to ingredients that I use again and again in my back to school meal planning is Butterball® Ground Turkey! Let me tell you, friends, you may be thinking nothing but Thanksgiving dinner when you hear me say turkey, but there is so much more that can be done with this versatile and delicious protein! Butterball offers a wide range of high-quality turkey products including my favorite fresh ground turkey that is all natural with no artificial ingredients. It's lower in fat and calories than ground beef, making it a better alternative when I'm meal planning for busy school days. Not only is Butterball Ground Turkey great for dinner recipes, it's an awesome way to add some extra protein to your breakfast dishes, too! 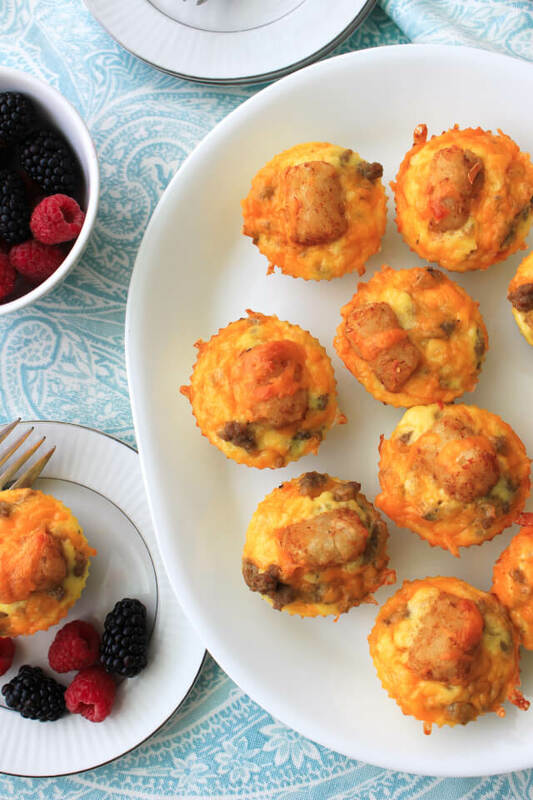 These cute little Cheesy Sausage and Tater Tot Breakfast Muffins are proof of that and are a great way to incorporate more protein into your family's breakfast. Bonus: the kids absolutely love them! I'm not going to lie, I'm kind of crazy about them, too! When I prepared the Butterball Ground Turkey for this recipe, I made it completely breakfast-worthy by seasoning it with some sage, thyme, and maple syrup. Adding those simple ingredients that you probably already have in your pantry will easily transform the turkey into super tasty and lean breakfast sausage. Bet you didn't realize it was that easy to transform ground turkey into breakfast sausage, right?! Once the turkey is seasoned, cooked through, and crumbled, half of it is incorporated into the egg mixture and the other half can be frozen for later use in another batch of muffins down the road. Or you could even use it in omelets, casseroles, or mixed into scrambled eggs. Get creative! 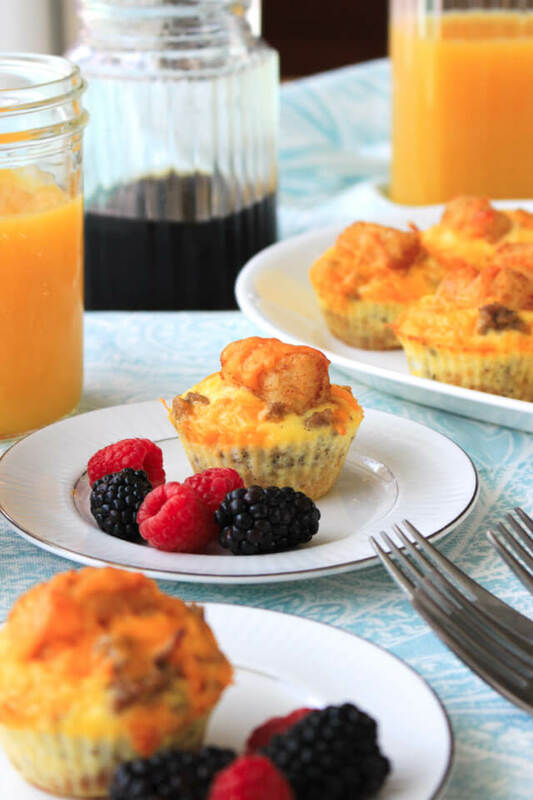 One of my favorite things about these muffins is that they can be made ahead of time and then quickly reheated in the mornings. This is perfect for saving time as we work on getting back into the swing of our morning routine on school days. 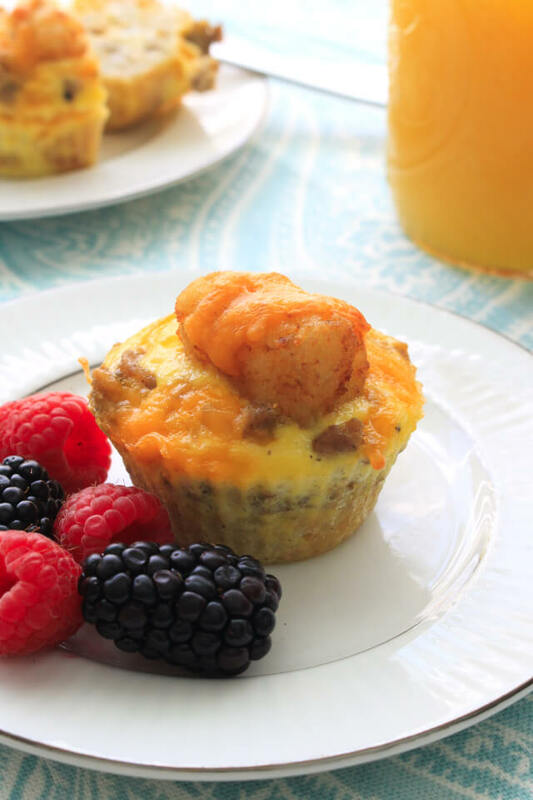 The portion size of one breakfast muffin is perfect for the kids for breakfast and, paired with some fresh fruit and yogurt, they kids are good to go with a wholesome meal to start their day. Because they are portable and can be made ahead, my husband can easily grab a few for himself on the way out the door to work, too. It's a win all around. 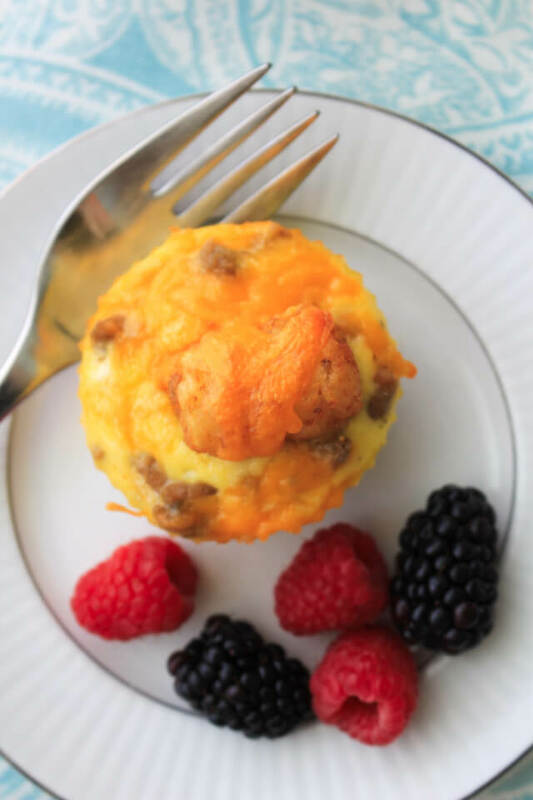 While I generally use full-fat milk and cheese in most of my cooking, you can easily lighten up this little breakfast cups by substituting low-fat milk and cheese. I think I might even try mixing in some fresh spinach, tomatoes, or bell peppers the next time I make these as well for an extra nutritional boost and a little pop of color. You can even try substituting the cheddar cheese for a spicy pepper jack or mild mozzarella. Make them your own! My daughter even suggested that we have these breakfast muffins for dinner one night. Then, she said that she would even like them in her lunchbox one day. How great is that? You know that they are kid-approved when the kids are willing to eat them any time of the day! I totally have to agree with my wise 8-year old, though. 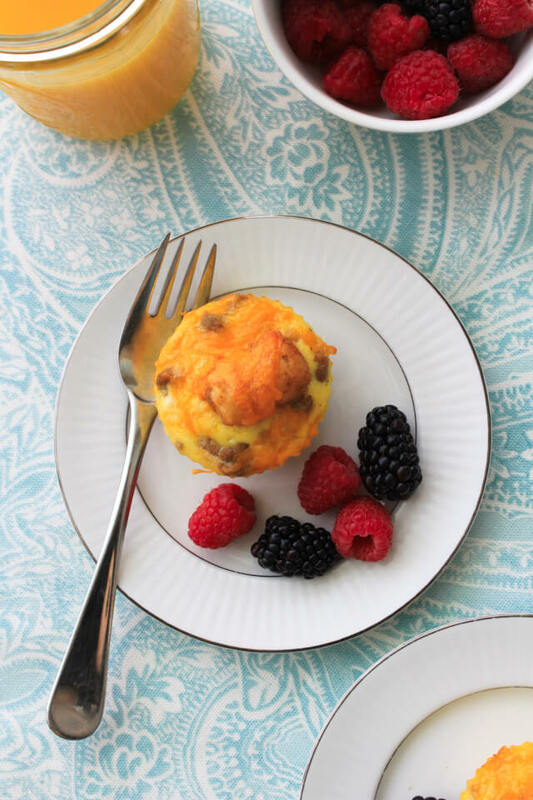 Grabbing some of these muffins from the freezer would make a super quick and easy breakfast for dinner on a hectic school night. 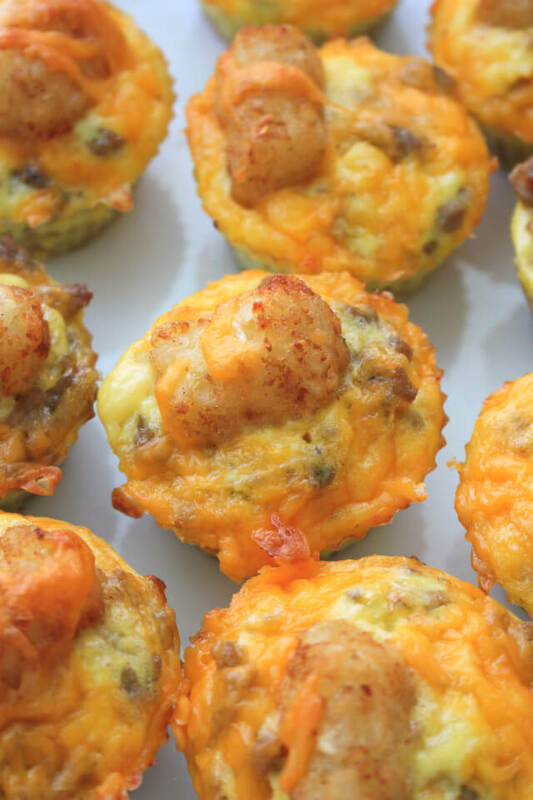 I know that if you add this Cheesy Sausage and Tater Tot Breakfast Muffins recipe to your breakfast and dinner meal planning rotation this school year, you won't be disappointed! If you're looking for more great meal planning ideas featuring Butterball Ground Turkey, visit Butterball on the web to get more delicious recipe inspiration! And don't forget to print the coupon below before you head to Walmart to get your ground turkey. Hooray for money saving coupons! I also invite you to check out my friends at Butterball on your favorite social media sites to stay in the know with all things Butterball! Instagram is a personal favorite of mine. 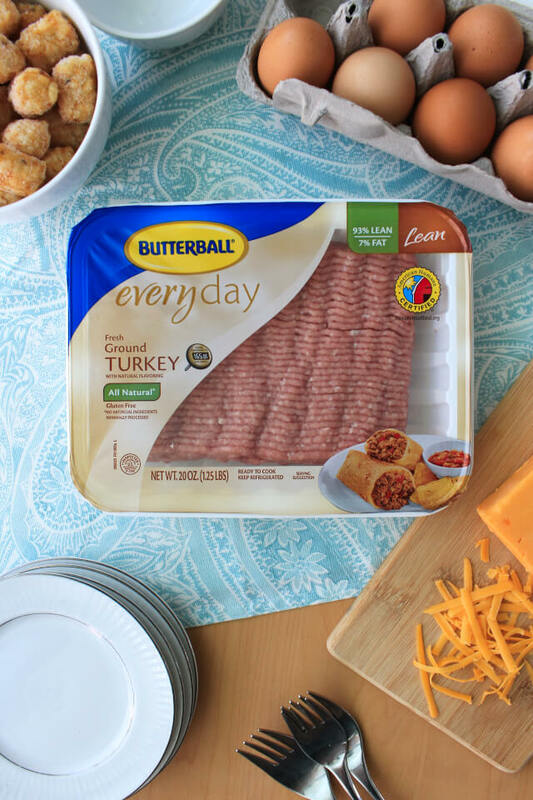 What is your favorite meal to make with Butterball Ground Turkey? I'd love for you to inspire me! Let me know in the comments below. For all of you moms and dads with out there with kids headed back to school, have a great year!! 1. 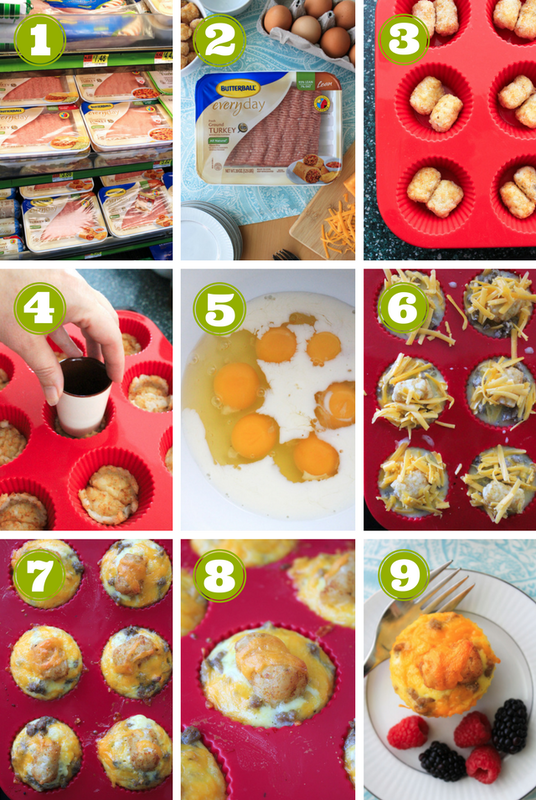 Preheat your oven to 400 degrees F. Place 2 frozen tots into each cup of a greased 12-cup muffin tin or silicone muffin pan. Bake the tots for 12 minutes. 2. Meanwhile, heat a large skillet over medium-high heat. Season the ground turkey with the salt, pepper, sage, thyme, and maple syrup and cook until crumbled and no longer pink. Drain and package half of the turkey for a later use. 3. In a large mixing bowl, mix together the eggs, milk, and half of the shredded cheese. Add the other half of the ground turkey to the bowl and mix. 4. Remove the tots from the oven and press down with a spoon or the bottom of a glass. 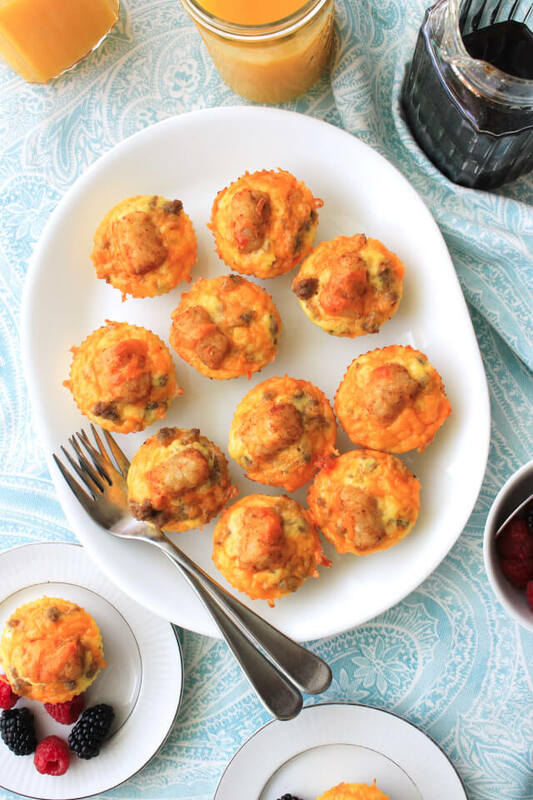 Fill the muffin cups with the egg mixture, a tot, and some of the remaining cheddar cheese. Reduce the oven temperature to 350 degrees and cook for 20-25 minutes or until the eggs are set. Enjoy immediately or freeze for later.